There are a few tax changes that you might want to make yourself aware of in 2018. Many of these new changes are updates from the IRS and a major tax reform that was passed by Congress. These changes have the potential to alter your situation drastically in the 2018 tax year and future years to come. The IRS usually unveils its new changes to taxes every year. This includes any cost-of-living adjustments for retirement savings, as well as inflation changes on specific tax provisions. All of these changes, along with the bill that was recently passed by Congress, have the potential to result in major changes to the amount you owe on your taxes. Let’s take a look at some of the most prevalent ways these new changes can affect you. If you’re an individual with an annual income of over $500,000, you’re in the new top income tax rate. The new 37 percent top rate will also apply to any married taxpayers that file jointly at $600,000 and higher. The existing child tax credit has been increased to $2,000 per each qualifying child, as long as they are under the age of 17 years. This figure is up from the previous amount of $1,000. For those that do not qualify for the new $2,000 credit, a $500 credit will be available. As far as standard deductions go, anyone that is married and planning on filing jointly will notice an increased standard of deduction of $24,000. This is a decent leap up from the previous amount of $13,000. There is now a $12,000 standard deduction for all single taxpayers and those that are married, but wish to file separately. This amount has increased almost double its original amount of $6,500. If you identify as the head of your household, you will see the amount increase from $9,550 to $18,000. If you’re an employee that participates in a retirement plan, you may be able to now contribute up to $18,500 this year for your retirement plan. This amount is a $500 increase from the $18,000 limit of 2017. Some of the participating plans include: 401k, 403b and most of the 457 plans, along with the Thrift Savings Plan. If you contribute to an individual retirement account or IRA, you’ll notice higher income ranges following the cost-of-living adjustments. For single taxpayers, the new limit becomes $63,000 to $73,000. A large majority of the deductions remain unchanged under the new tax law. However, there are a few to mention that are being removed. 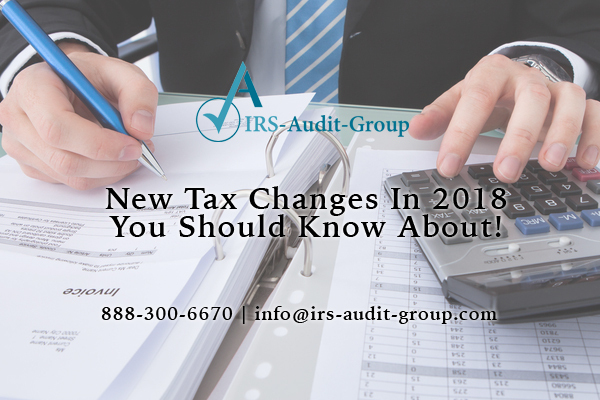 The following deductions are no longer available under the new 2018 tax laws. It’s important to be aware of each of the changes made for the 2018 tax season, as well as any new tax laws for the future. Being up-to-date on all the latest laws and regulations will help to avoid any headaches when it comes to making sure your taxes are done properly. Each year the IRS makes changes to how our taxes are done, like adding or removing deductions and making changes to tax rates. Changing income rages, as well as changes on corporate levels can make the ever-evolving tax laws seem like a chore to keep up with. The good thing is that for some people, these changes can be beneficial to them and their entire family. Prepare yourself for the current tax season and all upcoming seasons, so that you can avoid any costly mistakes on your taxes.